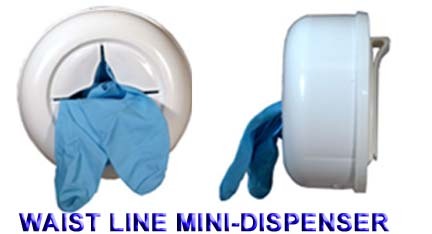 This is a portable dispenser that can be mounted to your Belt, Pant Hip, or Pocket. It stores 5 pairs of 9" Latex, Nitrile, or Vinyl gloves. This is great tool for on-site workers who need to carry a few extra gloves around. * DIMENSIONS: Diameter: 3 1/4"